With the rise of popular TV shows like Tiny House Nation and Tiny House, Big Living, you’d think Leah and Brady’s story would be more common. Tiny houses and the entire industry and community surrounding them have helped answer the call for greater diversity of housing options in the face of housing shortages, urbanization, and consumerism. For many, tiny houses represent not only a cheaper and more eco-friendly home, but an entirely different way of living–less things, more freedom, more time with loved ones, more time outside. Yet, in spite of both a growing demand and supply for tiny houses, they have not boomed in the way our cultural fascination with them would suggest. One reason? It’s exceedingly difficult to live in them legally. Many local governmental building and zoning regulations make it difficult to construct and permanently reside in tiny houses, particularly those on wheels. While some governments simply haven’t thoroughly considered the issue, some cite concerns over maintaining the integrity of neighborhoods and property values, ensuring safe building standards, and avoiding transient populations. However, a growing number of municipalities are easing or amending regulations in favor tiny houses. They see potential disadvantages outweighed by benefits like increasing housing stock, increasing affordable housing, facilitating intergenerational living, attracting new residents, increasing revenue, supporting vulnerable populations, and generally providing residents with more lifestyle freedom. Furthermore, they recognize that many tiny house residents are ignoring current regulations, taking their chances living illegally until forced to move. Still, these governments represent a small minority. Like many new trends, widespread regulation has not caught up to the tiny house movement. For those governments interested in learning more about how their community wants to address this topic, this guide will overview basic policy considerations and a handful of case studies from around the country. There are two basic types of tiny houses–those set on a foundation and those with wheels (depending on the type of home, wheels can sometimes be temporarily or permanently removed). Most municipalities don’t currently have the language in their zoning codes to specifically address tiny homes. Tiny houses on wheels (THOWs) are often legally considered recreational vehicles (RVs) and must abide by those zoning and permitting requirements, making it difficult to live in an urban area. Both tiny houses with and without wheels can be considered “auxiliary dwelling units” or ADUs. Building and zoning codes can further specify ADUs into subcategories (e.g. “backyard cottage, second auxiliary dwelling unit, etc.). Many local governments also have minimum size requirements (often approximately 1000 square feet) for single-family homes, prohibiting construction of tiny houses on their own plots. This means that for a tiny house to be legally inhabited in a residential zone, it must usually be considered an auxiliary dwelling unit. Even if local governments legally allow ADUs, they must still comply with local building codes. Most local governments base their building codes on the International Building Code (IRC), which does not expressly address the construction of tiny houses, but can be prohibitory due to minimum size requirements like 7 foot tall ceilings and 70 square feet of floor space for habitable rooms. Definitions. Some governments, like Fresno, CA, have written “tiny houses” directly into their municipal codes. Others, like Portland, OR, have chosen to address them under the auspice of an ADU. If a community chooses not to categorize them separately, they should be aware of how tiny houses will be interpreted under existing definitions and laws for RVs and various types of ADUs (backyard cottage, granny flat, etc.). There is also no universal size range for tiny houses (many cite approximately 100 – 400 square feet), so planners will have to make their own determination regarding size. Occupancy. One of the ways Portland regulates tiny houses (and specifically the creation of tiny house communities) is through maintaining occupancy limits for all units on a particular property. In other words, the construction of a new ADU next to the primary house doesn’t change the total number of people (taking into account familial relations) who can live on the property. Other municipalities like Sonoma County, CA have decreed ADUs legal only for “caregivers” of someone residing in the primary house or vice versa. Some local governments also regulate ADU occupants based on criteria like their relation to the property owner or how many days of the year they occupy the unit. Minimum-size requirements. Many governments have minimum size requirements for primary structures in residential zones, often imposed to maintain the consistency in neighborhoods (both in size of buildings and people who choose to live there). Regulators need to decide whether these size requirements are appropriate for their planning goals. Additionally, they must decide whether there should be minimum (if different from building codes) or maximum size requirements (often either a fixed number or percentage of the primary unit) for ADUs themselves. Specificity about what constitutes square footage (e.g. porches, basements, wall thickness, etc.) will help avoid confusion down the line. Type of construction. Some municipalities allow ADUs to be converted from 1) an existing structure or house, 2) from new construction, or 3) both. For tiny houses to be a feasible option as an ADU, building and zoning codes must permit new construction detached from the primary dwelling unit. Set on a foundation. 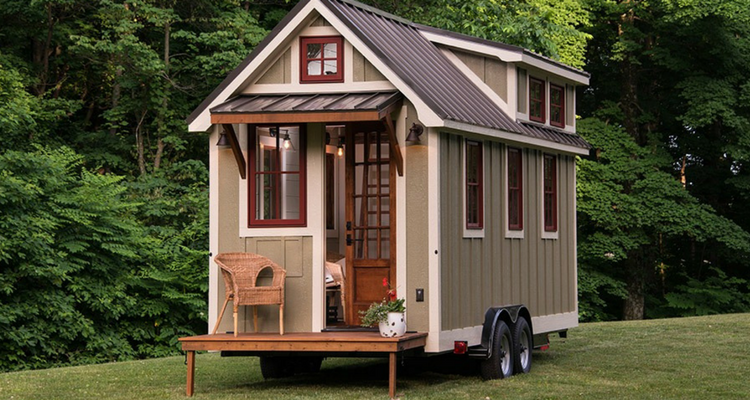 Whether or not to allow tiny houses on wheels (THOWs) is an important consideration. Some communities, like Spur, TX, publicly welcome tiny houses, but still require that they be set on foundations for safety reasons (e.g. heavy winds). Others, like Fresno, CA, have allowed tiny houses both with and without wheels. Regardless of the code, governments should know that many THOW owners will reside illegally until directed otherwise. Porches or skirts. Some governments, like Rockledge, Florida, wanted to support the idea of a tiny house community, but worried that THOWs would create a transient community. Their solution was to require porches (which can be removed if necessary), to encourage both a more established and connected community. Similarly, some regulations require ”skirts” to cover wheels, rather than removing them entirely. Utilities. Many tiny house owners see their choice of housing as part of an overall “off-the-grid” lifestyle. They can potentially survive without traditional utilities (hooked up to an electric grid, sewer, water) by using resources such as compostable toilets and solar energy. Planners should specifically address whether ADUs are required to be connected to utilities, and how they can share lines with the primary unit. Setbacks, entrances, visibility. ADU regulations typically address mandatory distance from property lines, location in relation to the primary house, visibility from the street, and where/how entrances can be constructed. Parking requirements. Depending on the density of the area, some governments require ADUs to come with one or more additional parking spaces. Whether or not an ADU allows for an increase in the property’s occupancy limit is one consideration for parking requirements. Style. Many fear the rise of tiny houses because of their potential to change neighborhood characteristics and property values. Governments that allow ADUs often address these concerns by requiring that tiny houses maintain aesthetic consistency with the primary house and/or be subject to design review during the permitting process. RV licensing. If municipal codes do not specifically define tiny houses, THOWs will most likely be considered RVs. Governments must then decide if existing RV licensing requirements and certifications are appropriate for THOWs. Permitting. Updating building and zoning regulations will often require a change in the permitting process. Governments can most successfully regulate tiny houses (and welcome them, if they choose), by clearly delineating the permitting process and providing supporting materials specific to tiny houses on their websites. These six case studies aim to represent the diversity of ways local governments are regulating tiny houses. They are not meant to be prescriptive, but to instead provide contextual examples for other municipalities to consider. These case studies generally feature regulations favorable to tiny houses, as the regulatory status quo among most local governments is unfavorable and/or does not address tiny houses. Each case study provides a brief background and highlights some of the new, amended, and/or unique regulations relevant to tiny houses. For more information about the case studies or municipal codes, see the sourced links below each section. In 2014, local advocates successfully petitioned Austin’s City Council to research how to reduce constraints on tiny houses. The resulting memorandum cited increasing housing and rental costs as well as shifting demographics (60% of Austin’s populace lived in single-person households) as local factors supporting the benefits of relaxing regulations in favor of tiny homes. In November 2015, the Austin City Council voted 7-4 to reduce restrictions on auxiliary units or “granny flats”. Zoning codes did not prohibit site-built (without wheels) tiny houses or place minimum size requirements on dwelling structures–meaning site-built tiny houses would be treated like any other single family home. Zoning codes treated tiny houses on wheels as RVs, meaning the person could only inhabit a tiny house on wheels in areas zoned for RVs. They could be stored on residentially-zoned properties, but not hooked up to utilities nor inhabited. They also had to meet federal motor vehicle standards and be registered as a travel trailer with the Texas Department of Motor Vehicles. Austin uses the IRC to evaluate permanent (not on wheels) residential projects with less than two dwelling units. As of 2015, the IRC requires 70 square feet of living area, allowing for all but the smallest of site-built tiny homes. The briefing memorandum suggested the City Council consider changes to residential zoning districts if they wanted to allow tiny houses with wheels to be considered either primary or secondary dwelling units on residential property. Only one parking space required, and zero required within 1/4 of a mile of an Imagine Austin corridor with a CapMetro line. Allowed for construction of ADUs on 5750 square feet of land (standard lot). Previously required at least 7,000 square feet. Allowed for construction of ADUs to .15 FAR (up to 1100 sq ft) instead of 850 square feet. Enables all applicable properties across the city to build ‘granny flats’. In early 2016, Fresno, CA Mayor Ashley Swearengin and City Councilmember Esmeralda Soria held a press conference to announce Fresno as the nation’s first city to allow tiny houses on wheels to be treated as a permanent auxiliary dwelling unit. This was in contrast to many northern California counties who had previously allowed THOWs as ADUs only for medical reasons. A community hard hit by the financial recession, Swearengin lauded the change as an eco-friendly way to provide more affordable housing and support local jobs and companies constructing tiny houses. Allowed for one 1) secondary dwelling units 2) backyard cottages or 3) accessory living quarters on any lot in any residential district where single-unit dwellings are permitted or existing. Secondary Dwelling Unit: May provide separate, independent living quarters for one household. Units may be attached, detached, or located within the living areas of the primary dwelling unit on the lot, subject to the standards of this subsection. Kitchens, including cooking devices are permitted. Minimum lot size: 6,200 sq. ft. Maximum floor area: 1,250 sq. ft.
Backyard Cottage: May provide separate, independent living quarters for one household. Units may be attached, detached, or located within the living areas of the primary dwelling unit on the lot, subject to the standards of this subsection. Kitchens, including cooking devices are permitted. Backyard Cottages shall be located behind the primary dwelling unit, unless attached and integral to the primary dwelling unit. Maximum floor area: 440 sq ft.
Accessory Living Quarters: May provide dependent living quarters. They may be attached, detached, or located within the living areas of the primary dwelling unit on the lot, subject to the standards of this subsection. Accessory Living Quarters may not provide kitchen facilities, however a bar sink and an under-counter refrigerator are allowed, but no cooking devices or other food storage facilities are permitted. Accessory Living Quarters shall not be located in front of the primary single-family dwelling. Minimum lot size: 5,000 sq. ft. Maximum floor area: 500 sq. ft or 30 percent of the primary single family dwelling (whichever is smaller). Development standards, lot coverage, and setback are in accordance with underlying zoning districts. Tiny Houses are expressly written into the zoning code, allowed as a “backyard cottage” under the conditions that it meets the existing requirements, and can be reviewed to maintain consistency with the aesthetic of the house and neighborhood. Portland has long been lauded as one of the few larger cities with tiny-house friendly policies. Citing more efficient use of housing stock and greater diversity of housing options, Portland’s building and zoning codes allow for one auxiliary dwelling unit (ADU) to be built per single-family dwelling site in all residential and commercial zones. However, tiny houses on wheels (THOWs) are still classified as recreational vehicles, and cannot technically be permanently inhabited outside of an area zoned for RVs. There is a strong community of tiny house advocates in this region, many of whom are pushing for further code reform. For now, many THOW owners live illegally, knowing there will only be trouble if someone complains. One ADU per site is allowed in residential and commercial zones, and in the central employment zones. ADUs can be created by converting part of an existing house or structure, adding area to an existing house, or constructing a new building (different building code standards are applied to new versus existing construction). The Zoning Code defines an Accessory Dwelling Unit as a smaller, auxiliary dwelling unit on the same lot or within a house, attached house or manufactured home. The unit includes its own independent living facilities with provisions for sleeping, cooking, and sanitation, designed for residential occupancy independent of the primary dwelling unit. Tiny homes on wheels (THOWs) may be stored but not inhabited in residential zones. The total number of persons that can live in both the house and ADU is the same as for one household: One or more persons related by blood, marriage, legal adoption or guardianship, plus not more than 5 additional persons, who live together in one dwelling unit; or one or more handicapped persons as defined in the Fair Housing Amendments Act of 1988, plus not more than 5 additional persons, who live together in one dwelling unit. Must be set back 40 feet from front lot line or behind the rear wall of the house. Detached ADUs must match the style of house (additional information). No additional onsite parking required. In July 2014, the 1,000 person community of Spur, Texas declared itself the nation’s first tiny house friendly town. Facing increasing urbanization and a dwindling population, Spur saw this proclamation as a way to attract young, educated residents. Requiring almost no building regulations, Spur marketed the “tiny house-friendly” community as a space for ‘pioneers’ who can enjoy the freedom of nature and open space as well as their choice of housing. Over 60 lots have since been sold and dozens of new people have moved to the area, some with tiny homes. In response to increasingly “experimental” housing types (yurts, underground homes, etc. ), the Spur City Council amended the tiny house proclamation in 2016, requiring them to be hooked up to utilities and for designs to be submitted for review. spurfreedom.org: Spur, TX information website for potential tiny home residents. The Tiny House must be on a foundation with at least six (6) inches of cement footing, which is steel reinforced for load bearing walls. A tiny home built on a trailer is required to remove wheels/axles in order to tie down to a foundation as described above. The Tiny House must have a driveway. A Pre-manufactured Tiny House is required to be skirted. The Tiny House must be located on a Common Access Route / Internal Street, and have an assigned address. The Tiny House must be connected to City utilities, which is water and sewer services. Sewer service is essential to dispose of all human waste. No composting toilets will be permitted. The Tiny House must comply with applicable portions of the 2005 Structural Standards Code of the City of Spur. In October 2015, the City of Rockledge, Florida became one of the most tiny house-friendly communities in the nation by zoning two districts for tiny homes. Spurred by the efforts of one resident, the Rockledge City Manager and City Planners came together to discuss how tiny houses could benefit the community by providing affordable housing, spurring economic revitalization, and wisely using the small amount of city land available for development. After seven months, the City Council passed the proposals, being among the first to include definitions for different types of tiny houses and other regulatory grey areas. Redevelopment Mixed Use (RMU). In these zones the city hopes that tiny houses will help spur economic revitalization, and create more ‘walkable’ neighborhoods. Planned Unit Development (PUD). Essentially a ‘pocket neighborhood’ for tiny houses. Planners added the requirement for porches for tiny houses on wheels, to help encourage a community of people who intend to put down roots in the city. Tiny Houses are defined as a principal residential dwelling that has a square footage between 170 and 1,000. Tiny Homes are only permitted within the redevelopment mixed use district (RMU) or a planned unit development (PUD) in a Pocket neighborhood setting. Built on a trailer that is registered with the builder’s local DMV. Towable by a bumper hitch, frame-towing hitch, or fifth-wheel connection, cannot move (and was not designed to be moved) under its own power. Has at least 170 square feet of first floor interior living space. Includes basic functional areas that support normal daily routines (such as cooking, sleeping, and toiletry). (more on THOW requirements here). Detailed structural plans, addressing how the structure is secured to the trailer, electrical plan, photographs of relevant structures and materials. A minimum of 4 tiny homes and maximum of 12 tiny homes per pocket neighborhood. Twenty-five percent of these home sites may be for THOW’s. Centralized common area. The common open space area shall include usable public spaces such as lawn, gardens, patios, plazas or scenic viewing area. Common tables, chairs and benches are encouraged, with all homes having access to it (more on common space requirements here). All homes must have both front and rear porches (more on porch requirements here). More on lot requirements, setbacks, and maintenance here. THOWs must be placed in a designated area in the approved site plan of the pocket neighborhood. All THOWs must be placed adjacent to common open space area. Must meet the tie down and skirting requirements of the Mobile Home requirements of the Land Development Regulations. The Building Official may require additional standards to ensure the porches hide any hitches. In the fall of 2016, the nonprofit organization Cass Community Social Services completed the first batch of houses in their tiny home community project in Detroit, Michigan. With 25 homes slated to be built on a two-block plot of land owned by Cass, the organization hopes to help turn low-income people into homeowners, bring density to a neglected area, and create a model for inexpensive, eco-friendly housing. Creating tiny house communities as a social services is not unique to Detroit. There are a handful of other successful models around the country, including Quixote Village in Olympia, WA and Dignity Village in Portland, OR. Each home will range from 250 – 400 sq. ft. of living space, on its own lot (approx. 30 x 100 sq. ft.) set on a foundation. Most houses will also include a front porch or rear deck. Professional contractors handle major construction, while supervised volunteers help with finishing jobs such as tiling, dry walling, painting, gardening, building decks and erecting fences. Total cost of 1.5 million dollars, $400,000 of which was donated by the Ford Foundation. Fundraising has been ongoing. All residents will be low-income, ranging from Cass employees, college students, retired and recently homeless individuals. A 300 sq. ft. home will cost $300/month to rent and approximately $32/month to heat (due to small space and energy efficient construction). Tenants will use a rent-to-own model, with potential to own the home if they stay for more than seven years. First Cass tiny home unveiled in Sept., 2016. Cass Community Social Services worked with the city to make sure the first-of-its-kind project was properly zoned. However, Detroit did not have zoning laws or minimum size dwelling requirements that would have significantly hindered building the tiny houses. In August 2016, the City Council in Wasilla, Alaska unanimously voted to invoke a six-month moratorium on single-family dwellings less than 700 square feet. The council stated that they wanted to let the planning commissioners decide how smaller homes should fit into the overall goals of the community. The councilmember who proposed the moratorium cited a well-known row of rundown cabins without long-term residents as an example of the potential negative effects of allowing tiny houses. In December 2016, the planning commission recommended that the City Council take no action to invoke a minimum size requirement for single-family dwellings, but offered that individual neighborhoods could request the adoption of a neighborhood plan with stricter requirements. The City of Wasilla does not require building permits for single-family dwellings. The six-month moratorium on tiny houses prohibited the construction of any single-family home less than 700 square feet until February 28, 2017. After discussing the issue for 3 consecutive meetings, the planning commission proposed a resolution with the recommendation that current regulations are appropriate for single-family homes. As these case studies show, there is no one-size-fits-all solution for tiny house regulation. Because the regulatory environment is still in its infancy, there are relatively few examples of local governments tackling this issue. Other governments must consider their own local factors and goals to provide a foundation for smart regulation. Asking these questions while providing space for community feedback and discussion is the first step to understanding how tiny homes should fit into a community’s long-term vision.